This system has gone through three phases. It all started with my original idea to use a central vacuum. Unfortunately this did not work out so well. The vacuum was extremely loud. I purchased the vacuum second hand and it ended up failing. The shop owner at Parkdale Vacuum exchanged the vacuum for my current detachable hose. He was very accommodating and this hose plays an integral part in my system. 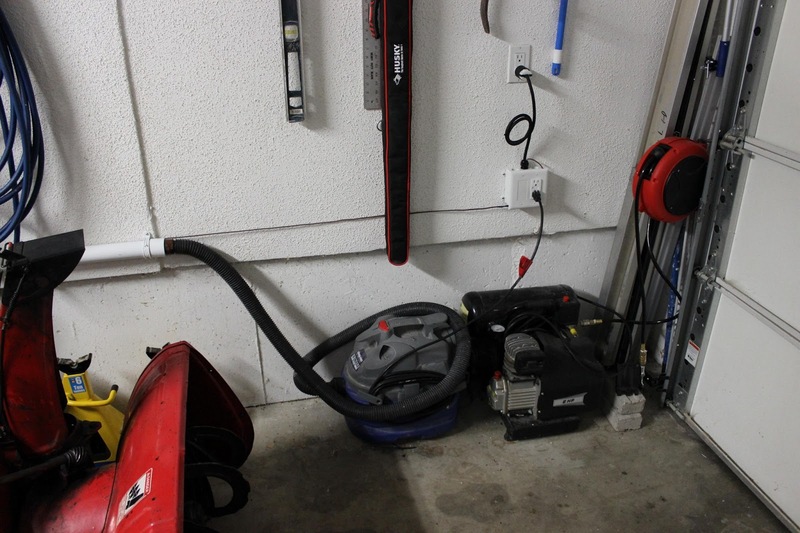 The second phase was replacing the vacuum with a Shop-Vac. This new vacuum was quieter and provided ample suction. At this point I switched on the vacuum by running outside and switching it on. It was rather inconvenient but it served my needs for the small amount of soldering I was doing. 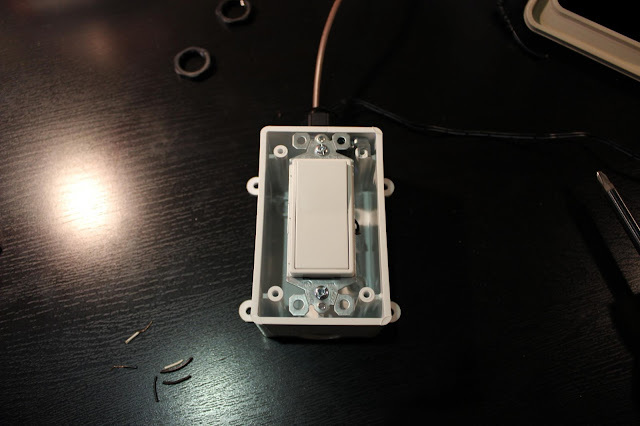 The final phase was adding in the remote control switch. 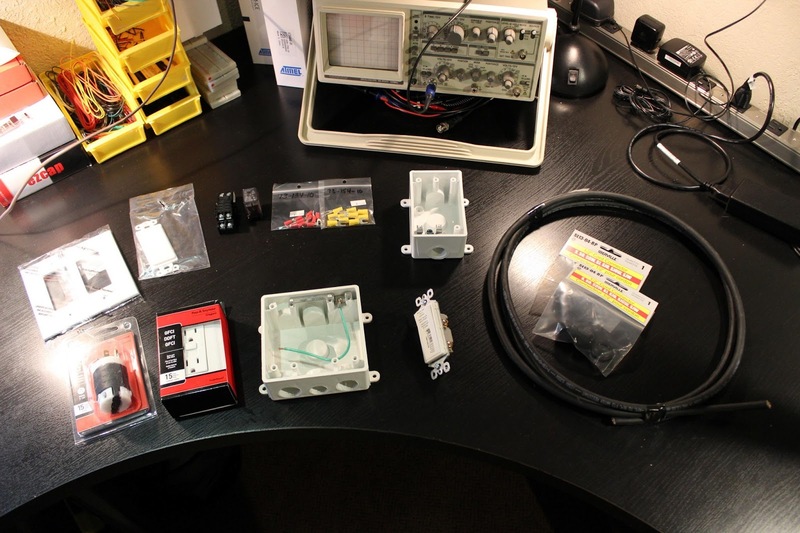 I have taken pictures of the electronics that I used to complete this portion of the project. 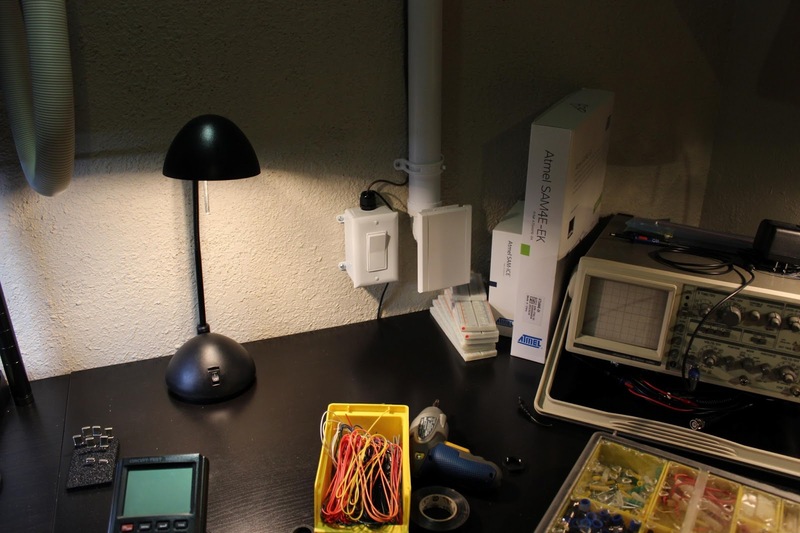 The control system is based upon a relay controlled outlet. I used two outdoor receptacle boxes, a GFCI outlet, a toggle switch, a relay and a small 6V transformer. 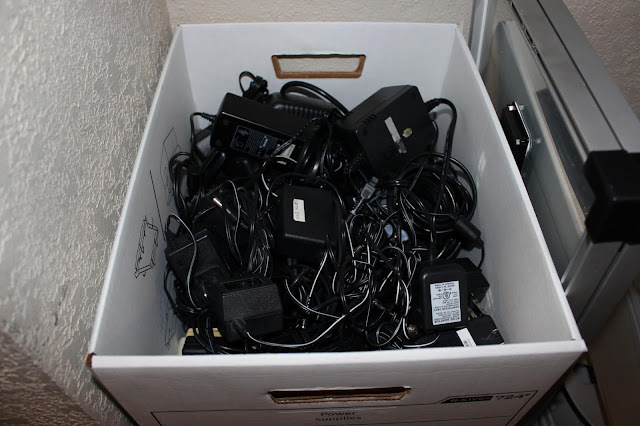 I was able to find a suitable transformer in my Professor Farnsworth box of "Assorted Lengths of Wire". 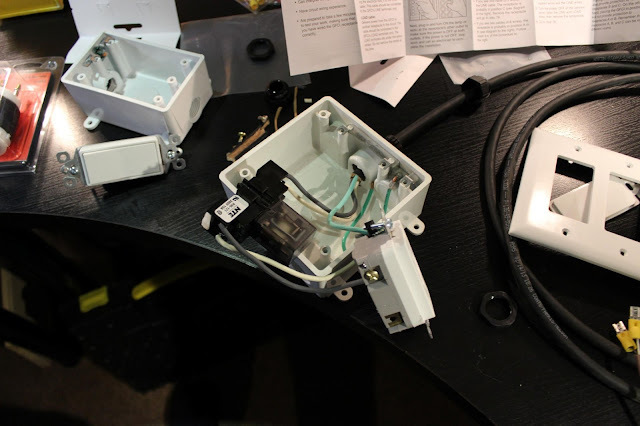 First I wired up the relay to control the hot and neutral lines of the mains voltage. The relay that I purchased was double pole, double throw so I decided to switch both. The coil voltage on this relay is 6VDC which is perfect for transmission along the pair of wires that run from the lab into the garage. The relay and GFCI just barely fit into the dual ganged receptacle box! You can see that I have added the control wire in the picture below. I have sealed the entire box up using a Decora wall plate. 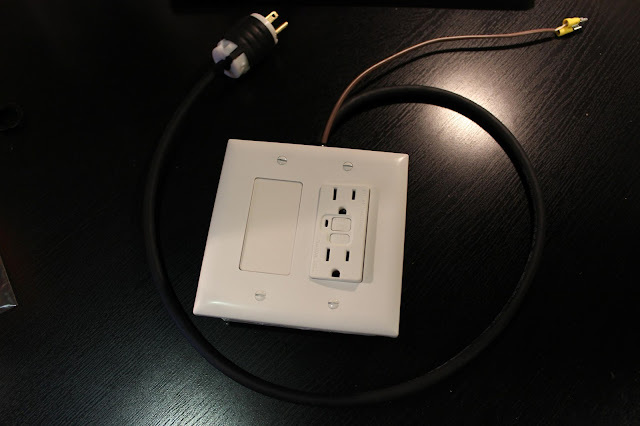 I added a very nice industrial grade male plug and tightened the grommet that enters the receptacle box. 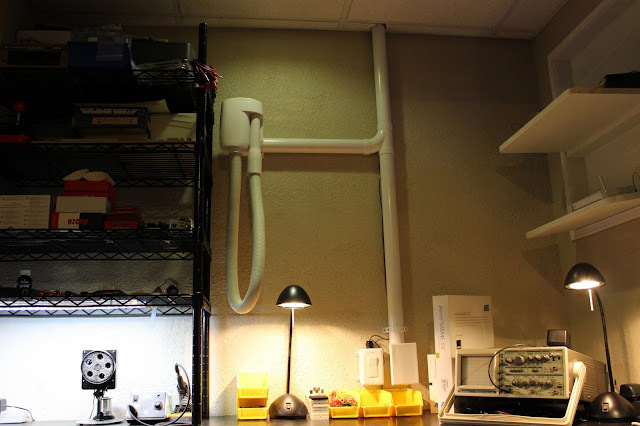 The relay controlled outlet is mounted in the garage. 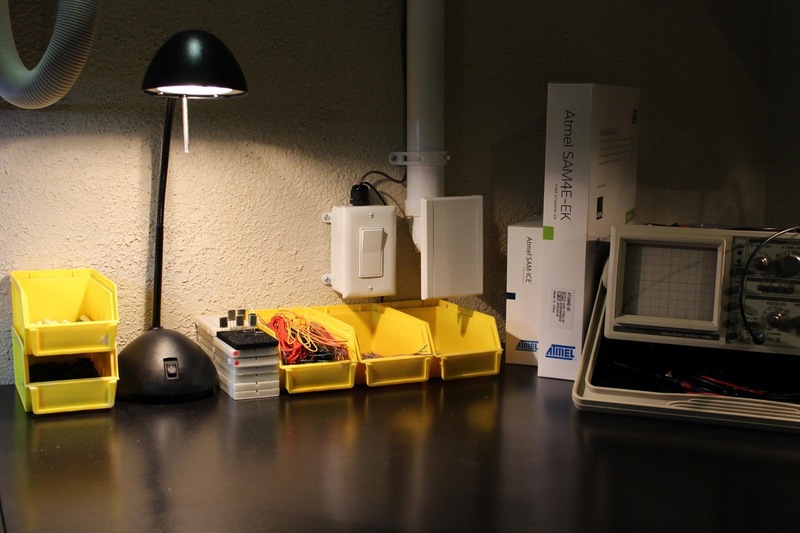 The next step is to create the simple box that toggles the relay from inside the lab. 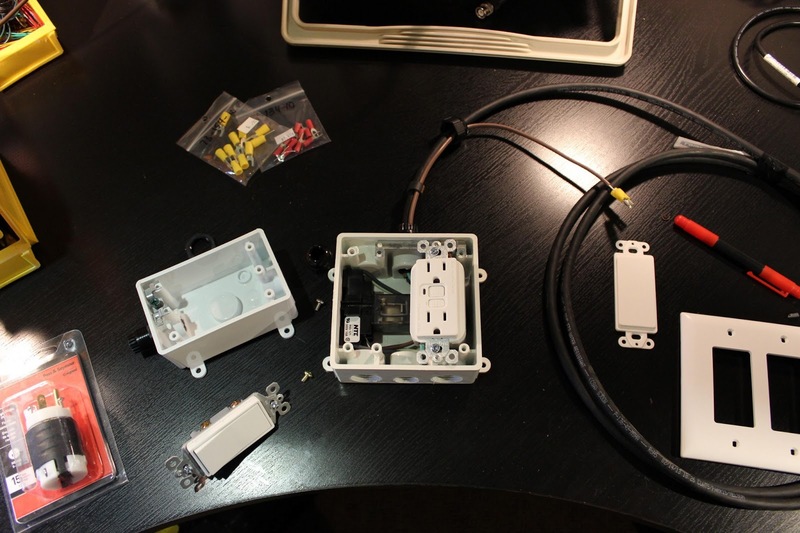 The wiring is very simple: 6VDC comes in on the black pair and exits on the brown pair. The final step was to mount the switch on the wall and route the cables neatly. 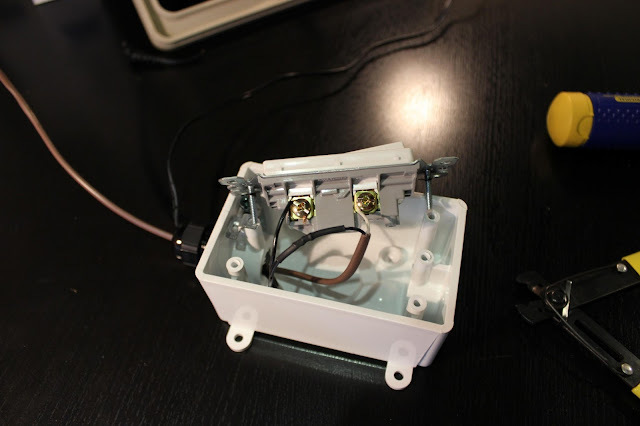 Mounted Switch :) Looks nice next to the air inlet. Here is another glamour shot of the system for good measure. I have decided to go "low-tech" and exclude microcontrollers from this project. I had (as usual) big plans to make it web controlled, but I didn't want to put in so much effort for something this simple. The only complaint that I have is that the system is somewhat loud. This could be remedied by installing a hose with a wider input nozzle. It is important to note that a system of this nature could pose a safety risk if extracting flammable fumes. I only use this while soldering and hot gluing to keep the odor and toxins out of the house. Neato, I've been thinking of doing something similar over my welding table. Question: what is the important role the hose plays? I may have missed the point of it. The hose is what I use to move the source of vacuum down to where I work. Most commercial fume extractors have an aluminum arm for this sort of thing. Hi Andrew! I work with engineering website EEWeb.com and would love to do an exchange of website links and feature you as a site of the day on EEWeb - see an example here - http://www.eeweb.com/websites/sparkle-labs/. Let me know if this is of interest to you! I can be reached at claire@eeweb.com.